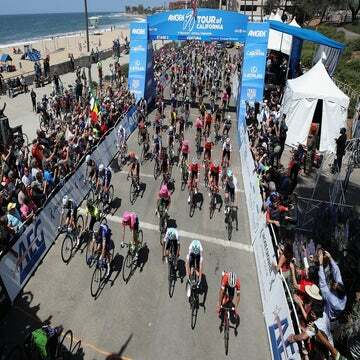 SAN DIEGO, California (VN) – Before this season, most of the elite cycling world knew nothing about 19-year-old Neilson Powless (Axeon Hagens Berman). And then he started winning, and winning some more. Through April, he had taken third overall at the San Dimas Stage Race, victory at the Redlands Cycling Classic time trial, and the overall title at the Joe Martin Stage Race, where he also racked up the win in the points competition (not to mention the best young rider competition). Most recently, he finished third in the Tour of the Gila time trial on his way to 12th overall. He leads the USA Cycling Pro Road Tour rankings. The kid is on fire. One person who has seen his rapid progress firsthand is teammate Logan Owen, winner of the Liège-Bastogne-Liège espoirs race this spring and a multi-time national cyclocross champion. Powless’s steady progression has taken him all the way to the Tour of California just two years after delving into road racing at a serious level, and four years removed from what he though might be a life as a pro triathlete. His parents met at a triathlon. The day after he was born, his mother, who ran for Guam at the 1992 Barcelona Olympics, brought him to the YMCA and into the pool. “They just didn’t want us to be afraid to try or do anything,” Powless said. In 2011, he started getting serious about triathlon. He quickly realized it was hard to make a living in the sport, though he continued to compete. He won Xterra nationals, came third at worlds, only to improve upon those results in 2012 by winning both titles. Soon after he transitioned to mountain biking, racing in and around his Roseville, California, home. His meteoric rise continued. When he was 17, he went to Europe with the national mountain bike team and also spent time dabbling in road racing. He had finished second overall at the Valley of the Sun Stage Race in Arizona, which led to his being selected to race the junior’s Paris-Roubaix, his third road race with the national team. He happily talks of crashing out of the race. The fact that he was extremely green is not lost on Powless. Last year, as a member of the Hagens Berman team, as well as the U.S. national team, Powless served his time in a domestique role, slaying himself for the benefit of others. He enjoyed and appreciated every minute of it. It all brings us back to California, which will undoubtedly be the biggest race in Powless’s nascent career. He’s all in. Powless is young enough that he can still be asked who his idol is, whom he wants to model himself after when he “grows up.” The answer comes quickly.